Amazon has announced that their upcoming Kindle Fire tablet will launch with several thousand apps available for download in addition to Amazon’s own feature programs. 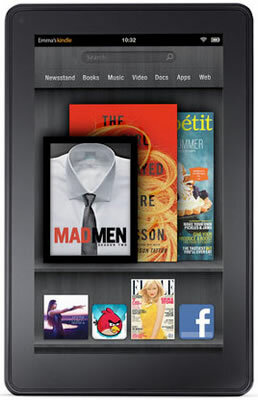 All apps are Amazon-tested on Kindle Fire and will be available exclusively though the Amazon Appstore. Amazon started talking with app developers the same day they introduced the Kindle Fire and they claim the response has been overwhelming. All of the industry-leading social and music networks will be available – Facebook, Twitter, Pandora and Rhapsody, just to name a few. Netflix has also developed an app for Kindle Fire that will allow subscribers to log in and watch television shows and movies anywhere with Wi-Fi access. The Weather Channel is another featured app available to Fire users. Casual gamers have plenty to look forward to as well. EA, Zynga, Gameloft and PopCap Games were highlighted in the press release, each looking forward to porting hit titles to the Kindle Fire. Some of the mentioned titles include Words With Friends, Plants vs. Zombies and Jenga, among others. App pricing hasn’t been specified yet but we suspect apps will be priced the same as they are in the Android Market. It’s worth mentioning that once you purchase an app through the Amazon Appstore, it becomes available on your other Android-based devices as well. Amazon’s $199 Kindle Fire is slated to ship on November 15 and features a 7-inch, 1024 x 600 IPS display, a dual-core ARM processor, 8GB of storage, a USB 2.0 port and runs a custom version of Android Gingerbread. Battery life is good for up to 8 hours of continuous reading or 7.5 hours of video playback with wireless disabled. Buyers will also be rewarded with a complementary 30-day trial of Amazon Prime, a service that normally runs $79 per year.